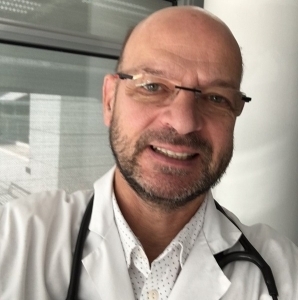 Dr Dominique Stephan is professor of vascular medicine and head of the “Hypertension, vascular medicine and clinical pharmacology” unit in the Cardiovascular Department of the University Hospital in Strasbourg since 2003. He received his M.D. from University Louis Pasteur in Strasbourg in 1989 and he specializes in cardiology and vascular medicine. Dr Stephan received a diploma in biostatistics in 1989 (CESAM). Dr Stephan held a postdoctoral position in the cardiovascular research center in Ann Arbor, Michigan, USA, from 1994-96 under the scientific direction of Pr Elizabeth Nabel. He studied gene and other biological therapies for vascular diseases. From 1996, Dr Stephan held a professor position in clinical pharmacology in the University Louis Pasteur in Strasbourg, France. He founded the “Research laboratory on angiogenesis” in the faculty of medicine Strasbourg. In 2003, Dr Stephan became head of the “Hypertension, vascular medicine and clinical pharmacology” unit in the University Hospital in Strasbourg. He devoted his scientific effort to clinical research in the field of gene and cell therapy in critical limb ischemia and venous thromboembolism. Dr Stephan is first, senior or co-author of 60 peer-reviewed publications. He is a member of the European Society of Cardiology. In the 1990s, gene therapy and gene transfer was of immense interest to researchers and clinicians. The possibility was offered to treat certain pathologies, like post-angioplasty restenosis, by the administration of genes. In this topic, Dr Stephan worked on gene therapy in vascular diseases from 1994 to 1996, thanks to a postdoctoral fellowship in one of the best research laboratory on gene therapy in the USA. He published a paper devoted to gene transfer using a non-viral vectorisation of gene by cationic liposomes which has been referenced 164 times [Stephan D et al. A new cationic liposome DNA complex enhances the efficiency of arterial gene transfer in vivo. Hum Gene Ther 1996;7: 1803-12]. Then, Dr Stephan studied the inhibition of vascular smooth muscle cell proliferation and intimal hyperplasia by gene transfer [Stephan D et al. Inhibition of vascular smooth muscle cell proliferation and intimal hyperplasia by gene transfer of beta-interferon. Mol Med 1997;3: 593-599]. Back to France in 1996, Dr Stephan founded the “Research laboratory on angiogenesis” in the faculty of medicine Strasbourg. He and his team worked on gene transfer into human endothelial cells using a non-viral agent [Zaric V, …, Stephan D. Effective polyethylenimine-mediated gene transfer into human endothelial cells. J Gene Med. 2004;6:176-184]. The topic of angiogenesis appeared to be very interesting both in research and clinic and Dr Stephan decided to focus his research effort on this thematic. He developed a model of fibrin gel chambers to study angiogenesis and the effects of various pro or antiangiogenic compounds. The work on this original model was granted by several paper in high factor index peer reviewed papers: [Hudlett P, …, Stephan D. Angiogenesis and arteriogenesis are increased in fibrin gel chambers implanted in pre-hypertensive SHR. J Hypertens 2005;23:1559-64; Miternique-Grosse A, …, Stephan D. Antiangiogenic effects of spironolactone and other potassium sparing diuretics in human umbilical vein endothelial cells and in fibrin gel chambers implanted in rats. J Hypertens 2006;24:2207-2213; Siegel L, …, Stephan D. Antiangiogenic properties of lupulone, a bitter acid of hop cones. Anticancer Res 2008 28:289-294]. Since 2003, Dr Stephan was part of several international clinical trials in the field of gene and cell therapies in critical limb ischemia as a natural continuum from the work done in the laboratory [Nikol S, …, Stephan D, et al. Therapeutic Angiogenesis With Intramuscular NV1FGF Improves Amputation-Free Survival in Patients With Critical Limb Ischemia. Molecular therapy 2008 16 :972-8; Pignon B, …, Stephan D, et al. Autologous bone marrow mononuclear cell implantation and its impact on the outcome of patients with critical limb ischemia – results of a randomized, double-blind, placebo-controlled trial. Circ J 2017;81:1713-20]. Since 2010, in 2010, the advent of new oral anticoagulants (NOACs) revolutionized the management of thrombotic diseases. Dr Stephan and his team worked on the clinical development of the NOACs particularly in venous thromboembolism (VTE) i.e. deep venous thrombosis and pulmonary embolism. The vascular unit Dr Stephan headed was part of several international clinical trials in this field [EINSTEIN Investigators. Oral rivaroxaban for symptomatic venous thromboembolism. N Engl J Med. 2010;363:2499-510; EINSTEIN–PE Investigators. Oral rivaroxaban for symptomatic pulmonary thromboembolism. N Engl J Med. 2012;366(14):1287-97; Hokusai-VTE Investigators. N Engl J Med. 2013 10;369:1406-15; Hokusai VTE Cancer Investigators. Edoxaban for the treatement of cancer-associated venous thromboembolism. N Engl J Med 2018;378:615-24]. Taking the advantage of rapid dissemination of these new drugs, Dr Stephan and his team set up in 2012 a registry of patients suffering from VTE who were hospitalized in the “Hypertension, vascular medicine and clinical pharmacology” unit in Strasbourg. This register currently included 1400 patients (July 2018). Thanks to this register, the team published several articles in high factor index peer reviewed journals. These articles included the study of VTE risk factors, VTE comorbidities and VTE severity index [Gaertner S, …, Stephan D Rivaroxaban versus standard anticoagulation for symptomatic venous thromboembolism (REMOTEV observational study): Analysis of 6-month outcomes. Int J Cardiol 2017;226:103-109]. More recently, we studied the role of the cardiovascular risk factors of atherosclerosis in the VTE pathogeny [Gaertner S, …, Stephan D. Increased risk and severity of unprovoked venous thromboembolism with clustering cardiovascular risk factors atherosclerosis: results of the Remotev registry. Int J Cardiol 2018;252:169-174]. From this clinical observation, we conducted a research in collaboration with Pr Valérie Schini-Kerth, in a rat model of metabolic syndrome, studying the role cardiovascular risk factors in VTE pathogenesis.